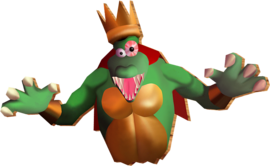 King Kut Out, also referred to as Cardboard K. Rool, is a giant cardboard cut-out of King K. Rool created and operated by two Kritters. It is the boss of Creepy Castle and serves as the seventh and penultimate boss of Donkey Kong 64. King Kut Out is made up of four parts: a head, torso, left arm, and right arm. The battle arena takes place outside during a rainstorm. The location itself is enclosed by a castle rampart in the shape of a square. There is a platform in the center of the stage, which is surrounded by water where a few Puftups dwell. There is a Tag Barrel in the very center, although Lanky Kong is the Kong that was specifically chosen by the boss door to fight King Kut Out. There are four cannons in the shape of a barrel, and each one is facing a wall of the arena. King Kut Out as seen in game. The seventh Boss Key was kept by two Kritters, who did not have a stronger character to guard it. As a result, they constructed a cut-out of K. Rool from cardboard to fight the Kongs. The battle begins just as King Kut Out appears at one of the wall sides. Every few seconds, the boss continuously appears from one wall to the next, and then reverses direction. It makes an "Aha!" sound just right when it appears from the next wall. For each two sides it appears from, King Kut Out blasts four lasers at the active Kong, before taking a pause every third time. To attack King Kut Out, the active Kong must enter the cannon facing King Kut Out and blast into it. After hitting King Kut Out, the Kong ricochets back into the arena. However, if their timing is off, the active Kong blasts out of the arena and cannot re-enter. The next Kong appears from the Tag Barrel, fought in a default order of: Tiny Kong, Chunky Kong, Donkey Kong, and lastly Diddy Kong. After hitting King Kut Out a third time, its right arm breaks off. After this, a decoy of King Kut Out follows it around, always appearing from the opposite wall. Its decoy is distinguishable from its darker appearance and incapability of firing lasers. The Kong must not blast at the duplicate, or otherwise are blasted directly out of the arena. Aside from the decoy, Ghosts begin to spawn in the center, around the cannons. They serve as an interference for the Kongs attempting to enter a cannon, although they can also be defeated to regain health. After being hit three more times, King Kut Out moves even faster, by moving from one wall to the next in approximately one second. It still moves at a normal pace while shooting lasers. To hit King Kut Out, the active Kong must immediately blast from the cannon just when King Kut Out appears from the wall in front. After another three hits, more specifically the ninth hit, King Kut Out is destroyed and its head falls off. The Kritters controlling it feel defenseless and retreat. The Boss Key appears in the center of the arena for the Kongs to obtain. After losing the battle, the Kongs are redirected into Creepy Castle from the portal to Troff 'N' Scoff; for the preceding six boss battles, the active Kong is redirected into the lobby, Troff 'N' Scoff. ↑ Bihldorff, Nate, Jason Leung, and Drew Williams. Donkey Kong 64 Official Nintendo Player's Guide, page 108. ↑ Barton, Jeff, Mario De Govia, and Donato Tica. Donkey Kong 64 Prima Official Game Guide, page 141.